San Diego was wonderful. We stayed with my friend Christina who was the ultimate host. Like me, Christina is also a water polo player and swimmer so we went on some much needed relaxing ocean swims in the evening at La Jolla Cove. Very nice! 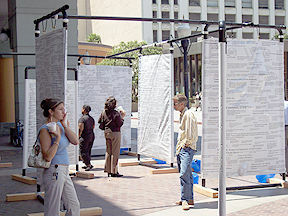 I spent a couple months trying to find a home for the Dialogue Project in San Diego. 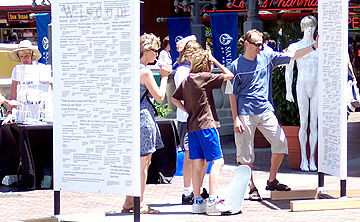 Horton Plaza in downtown San Diego finally came to my rescue so we set-up there for two days. Excellent reception and we ended up collecting hundreds of insightful quotes from viewers. 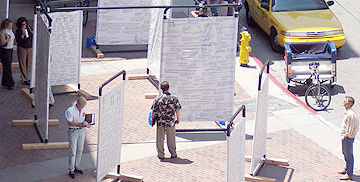 The San Diego Tribune wrote a great article too... click here to view it. You can also browse quotations that viewers submitted to us during our installation in San Diego on the "Quotes by Subject" pages. 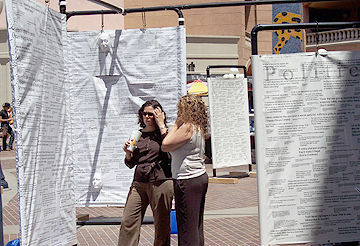 Here are photos taken during the San Diego public art installation of Dialogue. To view more photos simply click on the "next page of photos" link. There are around 25 photos total.